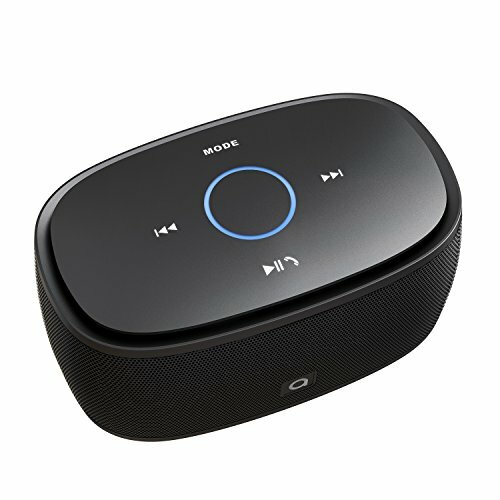 Easily switch between your 3 options of how to play your speaker (Bluetooth, Micro SD, Aux-In). Adjust the volume in style with the top ring of the speaker. Clockwise rotation to increase the volume and counter-clockwise to decrease. Asimom is a natural-born partner of amazon echo dot. It will not power off automatically, so it could work with echo dot perfectly. You can pair them via Bluetooth or auxiliary cable and enjoy enhanced beautiful sound. Incredible small body blasts out unbelievable clear and loud sound through 2x 3W high-performance drivers. Less than 1% total harmonic distortion ensures enhanced clarity and fidelity. At Asimom, we believe in our products. That's why we back them all with an 18-month warranty and provide friendly, easy-to-reach support. Touch Sensitive: Asimom touchable Bluetooth speaker is friendly to use and providing an intuitive control experience, making volume control easily achievable with a simple finger movement. Compact and Powerful: Asimom portable Bluetooth speaker capable of delivering a stunning sound with powerful bass to a 6W audio driver and a passive subwoofer-the perfect home speaker and travel speaker. Multi-connection ways: Bluetooth 4.0 technology makes it compatible with all Bluetooth-enabled devices within 33 feet range. Supports aux-in and TF card, allowing you to enjoy your music any time. Ultra-Portable: The compact size makes it ultra-portable, can be effortlessly put in your bag. You can truly take music by Asimom mini Bluetooth speaker wherever you go. If you have any questions about this product by ASIMOM, contact us by completing and submitting the form below. If you are looking for a specif part number, please include it with your message. Massive Audio TKO104 TKO Series. 10 Inch, 600 Watt, 8mm Top Plate, Dual 4 Ohm Car Subwoofer. Sold Individually.